Welcome to the Security Centre. Learn how we protect your banking experience at Citi, and how you can protect yourself against identity theft and other security risks at the same time. As the first step to protect your accounts, we’ll educate you on the different types of fraud that exist – from discovering how to spot and stop fraud, to the additional preventive steps that you can take. 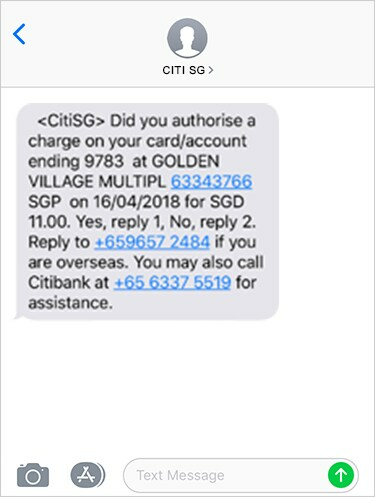 Always remember to check that the citibank.com.sg website has a valid certificate marked Citigroup Inc. [US] when you access Citibank Online. Here are few types of fraud and the preventive steps that you can take to prevent yourself from becoming a victim. Always check the sender's email address. Remember that Citi will never ask you to confirm a payment or transaction via email. If in doubt, don't click the link and report to Citi's fraud reporting service. Always type citibank.com.sg within the internet browser address bar. 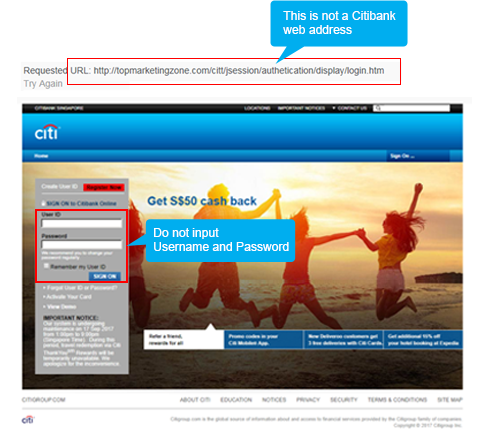 If ever in doubt, don't enter any information within the website & report to Citi's fraud reporting service. Ensure that the padlock icon is displayed on the internet browser address bar. Your internet browser address bar should always display "https" instead of "http" when banking with Citi online. SMiShing messages appear to be from a legitimate company and typically contain a link that takes you to a spoof website, or it may ask you to call a phone number. Even if you don't enter any information, clicking the link can lead to other problems, such as installing malicious software or dangerous viruses to your phone. You may receive an SMS from a fraudster posing as Citibank, requesting you to share personal information, such as account or card details. Fraudsters can utilise your details to make immediate purchases or fund transfers. We're constantly updating and improving our wide variety of security measures, providing you the confidence you need when using Citi Mobile or Citibank Online. Our 128-bit SSL (Secure Sockets Layer) encryption engine provides industry standard levels of security, ensuring your information can't be accessed by anyone else. The green address bar on Citi websites indicates that the site has undergone extensive vetting by our security teams and has been granted a security certificate known as an Extended Validation SSL Certificate. For safety, we’ll suspend your online access if three failed login attempts are made. We’ll also block access to cash machines if the wrong PIN is entered three times. Every time you sign in to Citibank Online, the date and time of your last visit are shown. If you didn't sign in then, this will indicate an unauthorised account access has occurred. You should reply to the SMS with "1" if the transaction is authorised by you or "2" if the transaction is not authorised by you. ("Long Code") if your registered number is not a Singapore number*. We will not ask for any additional information to be provided other than "1" or "2". If you are overseas or holding onto an overseas mobile number, please send your reply to +65 9657 2484. Please contact the Fraud Hotline +6563375519 if you have any issues. Citi Mobile® Token is a feature within the Citi Mobile® App that authenticates transactions as an alternative to other authentication methods such as Online Security Device, or One-Time PIN (OTP) via SMS. Protected by a 6-digit Unlock Code chosen by you and restricted to one device of your choice. Enter your unique Unlock Code to instantly authenticate your transactions initiated in Citi Mobile® App on your Citi Mobile® Token enabled device. No more waiting for an OTP via SMS, or worrying about misplacing your Online Security device. Authenticates all online transactions such as payments and transfers, adding new payee and updating your contact details. It also generates OTP for online purchases. After enrolling to Citi Mobile® Token, you should not share or reveal your Unlock Code to anyone, including Citibank. If you’ve misplaced your card, you can temporarily lock your card at Citi Mobile® App so that no one else can use it. You can unlock your card just as easily when you need to. While your card is locked, you will not be able to use it for point-of-sale transactions. However, any recurring payment instructions that you may have established on your card will not be affected. To terminate your card and request for a replacement if your card is lost or stolen, please call our Citiphone hotline. 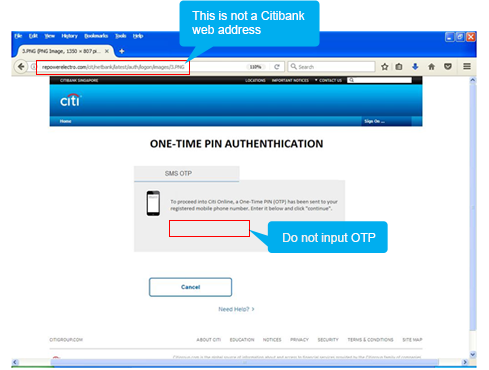 Change your Citibank Online User ID, Password and ATM PIN immediately. Customers of Citibank Singapore Limited are advised to check this page regularly for the latest security alerts and/or news. If you are unsure whether any call, email or SMS is genuinely from Citibank, please contact us immediately and refrain from taking any further action. 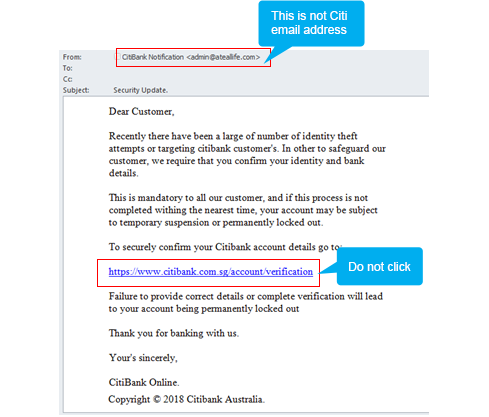 Whilst Citibank strives to provide you with the latest security alerts and/or news, please note that this webpage and the examples of scams/phishing listed here are not exhaustive. 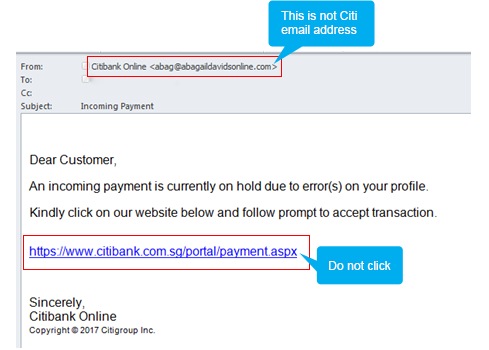 Description: Please note that we will send you email notifications from the following Citibank email addresses. Description: Be alert to emails and SMS scams. Complete a survey or a quiz, with the promise of cash prizes, loyalty points or air miles. Provide your card number, in order to participate in the survey or quiz. As a further tactic to convince victims of the authenticity of these scams, a One-Time Pin (OTP) will be sent to the mobile phone number that you've just provided. Unfortunately, with the successful solicitation of this information, the scammer would have gathered the necessary details to perform unauthorized transactions on your Citi Cards. When clicking on a link from an email, always check that the internet address that you are directed to is legitimate by verifying it in the web browser. If you're unsure, please check this with the brand or merchant. Never disclose your card numbers on merchant websites that have internet addresses that look incorrect. Check if the web browser displays a Locked Padlock icon. Reputable sites would have these. Never disclose your OTP to websites that you might be unfamiliar with. Always check your account statements regularly to detect any unauthorized transactions. For a real-time view of your transactions, login to the Citi Mobile® App. 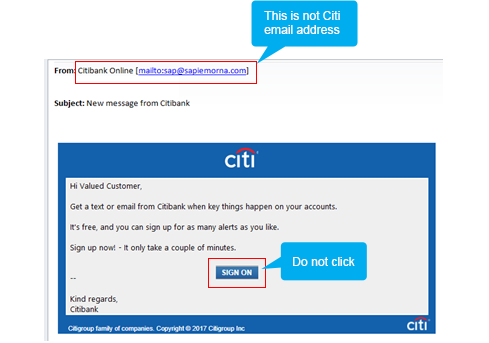 Description: We have detected phishing emails and webpages targeting Citi customers. 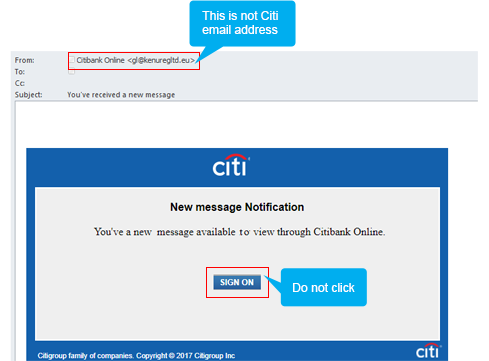 These phishing emails comes from a non-Citi email address and requests Citi customers click on a hyperlink to unlock / update their online banking / credit card account. 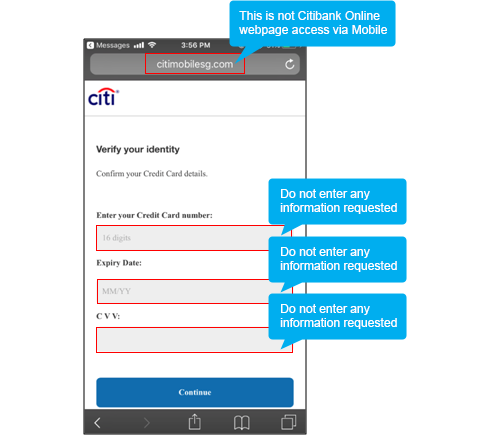 If a customer falls victim to the phishing email and clicks on the hyperlink, they will be redirected to a page URL that is not official Citi website, requesting for a user's information (Username and Password), followed by a request to provide an SMS OTP. Such websites are used to conduct card not present transactions but may also be utilized in order to steal personally identifiable data, username-password combinations, OTPs or infect a user's device as well as fraudulent enrollment of Citi © Mobile Token (which may be used to carry out payments to these fraudsters). Be alert. Minimize clicking on links in emails as these may not be legitimate. Check that you are using the official Citi website. Always type the Citibank Online website URL directly into the address bar of your browser. 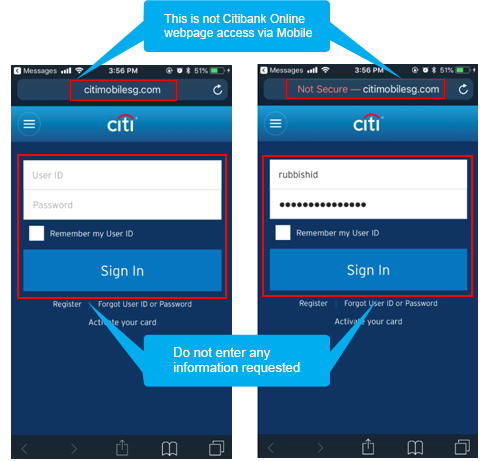 If you are on mobile, consider using the official Citibank Mobile application. Citi will never request for your PIN, password or OTP through phone call, email or SMS. Call Citiphone immediately if you notice unknown transactions appearing on your account. Description: SingHealth has reported a data breach affecting more than 1.5 million SingHealth patients. Patient data stolen included personally identifiable information such as names, addresses, birthdays, and NRIC numbers. Approximately 160,000 patients had details of medical prescriptions stolen. Stolen credentials may be used to conduct social engineering and phishing scams. Such scams utilize personally identifiable information to appear legitimate. Contact Citiphone immediately if you are in any doubt of a call, SMS or email's validity. Description: We have detected multiple Phishing Emails. The sender email addresses varies from those ending with @gmail.com, @hotmail.com, @yahoo.com, etc. 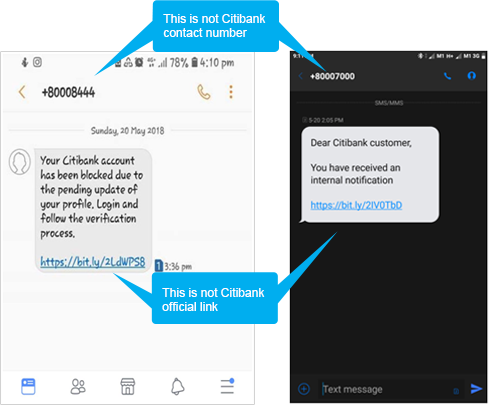 They contain messages including the requirement to update account details due to system maintenance or "New Message from Citibank". 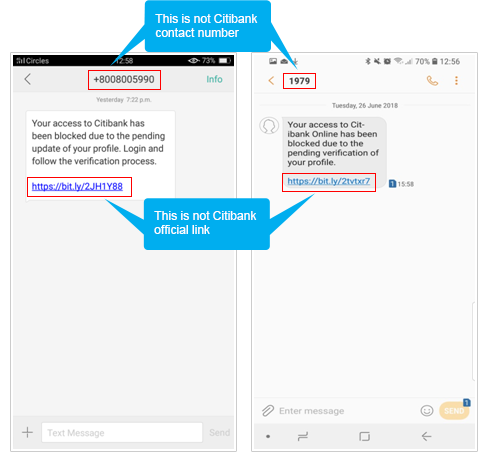 A hyperlink that purports to be a Citibank hyperlink (but is not) is also included in the message and takes customer to URLs that does not belong to official Citibank. The site has the same look and feel of that of Citibank Online. Such websites are designed to trick users into providing their online banking and credit card details to conduct fraudulent / unauthorized bank transfers and / or credit card transactions. Credit Card details provided could also be used to enroll for Payment Wallets such as Samsung Pay, Android Pay, Google Pay and Apple Pay.